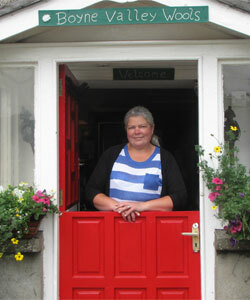 Alison Fullam Gogan lives in the heart of the Boyne Valley Co.Meath, Ireland. She has a large flock of Jacob sheep which won second place in the recent All Ireland Flock assesments and she also was awarded Best Stock Ram in Ireland with the Jacob Breed. Alison Hand spins all her own Jacob wool and crafts products with the finished yarn such as woven scarves, hand knit hats, socks, rugs, throws etc. Also on the farm are a number of different breeds of sheep including Belclare, Zwarble, Kerry Hill, Teeswater and many more. Alison has converted the old farm house in the farm yard into a craft studio with on going demonstrations of this wonderful craft and all the yarn and products are for sale in the studio. If you would like to learn more about Boyne Valley Wools please don't hesitate to contact us.